This is the most common kind of storage used in our computers. It is made up of a non-magnetic platter covered with a magnetic material. The magnetization of this magnetic material causes data to be stored. The non-magnetic platter spins at a high speed and a read/write head fixed on an arm helps to access the data. This is a device that uses solid-state to store data, it has no moving/mechanical part and its data storage process is done electrically unlike in HDD which is magnetical. All data stored on SSD is on an interconnected flash memory chips which retain the data even after the computer is shut down. Do you have an issue with the type of hard drive to buy? Here are some few points to consider for you to go for the best type of hard drive available for now. The SSD is known for its speed. Its average time for accessing data is 35-100 microseconds and is not affected by fragmentation which makes it extremely fast compared to HDD which can be fragmented and will need defragmentation for it to be optimized. Are Bluetooth Devices and Gadgets Bad for Health survey of 2018? Speed is a very important factor to consider when using software that accesses the substantial amount of data. generate heat, wear out, and can fail at any given time. SSD is not in any way affected by magnetism and makes use of a smaller amount of power in the cause of operation, unlike HDD in which all data stored on it can be wiped using a powerful magnet and also uses quite a large amount of power. 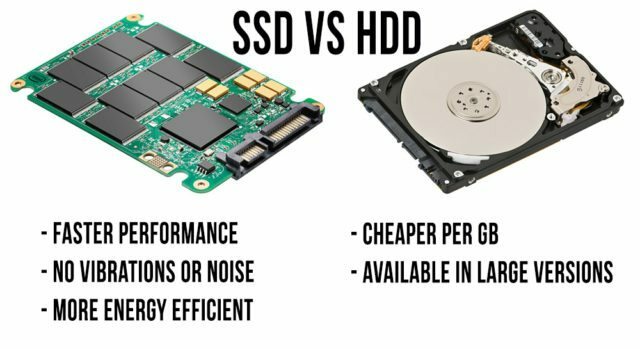 Do you need a faster experience when using your computer, the reduced amount paid for the energy bill, increase in the lifespan of your laptop’s battery, a reliable data storage, no noise during operation, a small compact and efficient data storage device, then Solid-State drive (SSD) is the best option.